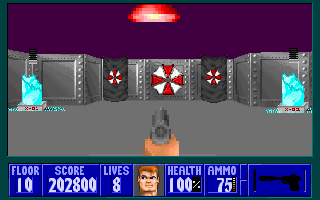 After many months of hard work, I have released my very first Wolfenstein 3D mod. 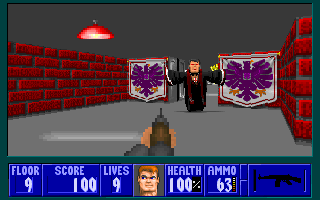 Entitled Wolfenstein: Umbrella Beginnings, it fuses the world of Wolf3d with Resident Evil. The first Episode, called Discovery (Released April 23,2009) is 10 levels long including a secret level. The next two episodes are still in production and will be released at a later date. You can download WUB here or here. 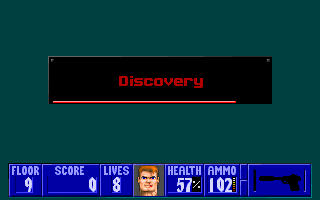 *Note* If you have not done so already please visit id software’s site here and download the original Wolfenstein 3d saga. They are super cheap to buy and well worth it! It is the game that started the modern day first person shooter! I give full credit to id software for any original content used in my Wolf3d mod. Thanks for releasing the source code id!!! I also give full credit to Capcom Entertainment for the Resident Evil references I use within my mod. My mod is free of charge!! 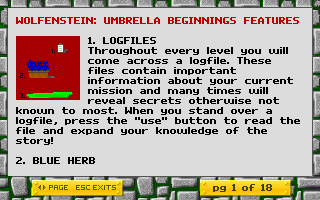 This entry was posted on April 24, 2009 at 4:34 pm and is filed under Technology/Cool Stuff, Video Games, Wolf3d Mods/TC's, Wolfenstein 3d with tags Discovery, Wolfenstein 3d, Wolfenstein: Umbrella Beginnings. You can follow any responses to this entry through the RSS 2.0 feed. You can leave a response, or trackback from your own site. Cool! Can’t wait for episode 2!